Ok, I get it. Donald Trump was elected president by ‘frustrated, fed up’ voters who sent him to Washington, D.C. as the ultimate outsider to shake things up. To drain the swamp, get rid of special interests and make America great again. Blah, blah, blah. I hate to disappoint them, but Trump is on a fast track to be the most dishonest, corrupt, dangerous president in United States history. For the first time in 241 years we have an administration that cannot be trusted, ever. Gone are the days of simple political spin from the White House. What we have now is a fascist-like propaganda machine that would make Nazi Josef Goebbels proud. The lying is relentless and perpetrated not just by Trump, but also by his vice president Mike Pence, press secretary Sean Spicer, his cabinet members, and top advisors including Kellyanne Conway and Stephen Miller. Ever since Trump began his unconscionable birther campaign six years ago (btw, he’s even lied about that...saying it was Hillary Clinton, not he, who started it), candidate Trump has been on an intentional campaign to deceive his base of ‘forgotten’ angry whites who long for the good old days of the 1950’s when immigrants and minorities ‘knew their place’ and women were ‘barefoot, pregnant and in the kitchen.’ The game plan from day-one has been to twist and mangle their reality in the Trumpian post-truth era of “fake news” and “alternative facts.” Don’t shoot the messenger, but it sure seems like Trump views his supporters as the dumbest motherfuckers on the planet. 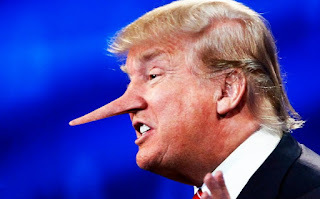 Trump appeals to the lowest common denominator of fear and bigotry, acutely aware that his lies flow through that myopic filter and thus stand little chance of being challenged or rejected. Remember, Trump himself said "I could stand in the middle of Fifth Avenue and shoot somebody and I wouldn't lose any voters." Turned out to be true. Trump and his propagandists realized this truth about his supporters before his 2106 campaign even began. That they can be lied to 24/7 without consequence. That they will not only accept the lies as truth but, in their intense hatred of Barack Obama and Hillary Obama, become loyal servants in spreading the lies at work, at the BBQ and on social media. They get most if not all of their information from Fox News and alt-right websites like Breitbart, so they have no ability to distinguish fact from fiction. Trump’s masterfully exploited this ignorance and lack of intellectual curiosity, tossing them juicy red meat through his fiery racist, xenophobic rhetoric. So it’s no surprise they believe Trump and only Trump. That they took it as ‘fact’ when he claimed that “thousands and thousands of Muslims were cheering” after 9/11. Or that he didn’t know former KKK leader David Duke. Or that he was against the Iraq war. Or that millions of votes in California were fraudulent. Or that he’s no longer involved in his business. Or that he can’t release his tax returns because he’s under IRS audit. Or that Mexico will pay for his border wall. Or that he won in a “landslide” with the most electoral votes of any president in decades. Or that his inaugural crowd was the biggest ever. Or that Obamacare is a “disaster.” Or that Obama “founded ISIS.” Or that the unemployment rate is 42%. Or that he’s already created tens of thousands of jobs. Or that Obama wiretapped him. Or that the media is “the enemy of the people.” I could go on. The level of lying is staggering and unprecedented. And there’s a pattern to the lies. The most egregious, outrageous claims consistently come right after there’s news released which Trump deems unflattering, upsetting or potentially harmful to his presidency. The bait-and-switch. It occurs like clockwork, as it did two Saturdays ago following Trump’s evidence-free Obama wiretap claim after Attorney General Jeff Sessions recused himself from the RussiaGate investigation. As intended, these deflections then send the media into wild-goose-chase fact-check mode, only to be stymied by surrogates who employ the patented “are you gonna believe Trump or your lyin’ eyes” defense. The lies come too fast and furious to keep up with. Mission accomplished. America under Trump at best has become a comic punchline. At worst a global disgrace. Baghdad Bob sits in the Oval Office, staining the presidency beyond recognition. We’ve turned into a nation without a heart and soul, led by a thin-skinned, vindictive, Kleptocratic orange devil-baby hellbent on lining his and his family’s pockets at the expense of taxpayers. It’s personal-enrichment before country. Ego before country. Pretty much anything before country. Of most concern is the grave danger that Trump poses to our very democracy. He’s a Vladimir Putin appeaser who inexplicably defends the murderous Russian dictator while summarily maligning and discrediting the U.S. intelligence community. His utter disdain for our free and open press and judiciary is an attack on our Constitutional bedrocks of free speech, due process and the rule of law. His business conflicts-of-interest and/or nefarious, possibly criminal dealings exposes him to impeachment, or worse, possible blackmail from foreign regimes and enemy states. Most alarming, his refusal to recognize and condemn Russia’s cyber attack last Fall, and his alleged collusion in the hack, undermines confidence in our electoral system. Is Donald Trump Losing His Mind?